Last week, Microsoft unveiled its new mobile operating system Windows Phone 8 and a feature called Kids Corner, which must sound like a godsend to parents who let their little ones play with their smartphone. It allows parents to enable a child-friendly interface that hides apps and phone features that rambunctious tots could cause trouble with. Kids Corner sounds remarkably similar to the brainchild of Toronto-based Martin Drashkov and Renat Gataullin, co-founders of Kytephone, an app for Google's Android phones and tablets. Not that they mind. Given that Kids Corner is exclusive to Windows phones -- which still represent a very small part of the mobile market -- they don't consider it direct competition. Plus, the headlines for Kids Corner probably helped generate a little extra buzz for Kytephone, which has only been out for a few months. Among Kytephone's features is the ability to track a phone remotely and manage it from a web browser. Parents can use the phone's GPS to see where their child is, see what photos have been taken with the device's camera, and control who can text or call their child, and vice versa. All the settings are password protected and even restarting the phone won't exit the child-proof mode. 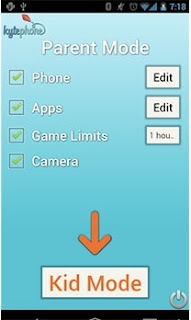 Kytephone can also set timers on apps and games so kids are limited by the guidelines parents set. The programming duo knew it was a matter of time before they starting seeing more competitors emerge. "To be honest, we were anticipating it," says Drashkov, 29. "We're kind of anticipating all the major players adding some kind of kid-specific controls. Apple hasn't done it yet but I think they'll do it soon." The development of Kytephone actually started with the idea of helping technophobe seniors use a modern smartphone without getting overwhelmed. But it became clear that smartphone design -- particularly in the case of the iPhone -- was getting more and more intuitive, so they switched their focus to designing a tool for parents. "We thought it was pretty obvious that it was only a matter of time until kids started using smartphones," says Drashkov. They ended up focusing on the Android platform for a few reasons. First, programming for iPhones was a non-starter as software developers aren't given the same level of access to Apple's operating system as is allowed on Android. Then there's the fact that Android is the most popular mobile platform in the world and there's a plethora of low-cost phones that parents can buy for their kids -- Kytephone can be used to safeguard a parent's expensive phone or it can be installed on a child's first phone. Drashkov says he's also heard from users who have children with autism or other developmental disabilities, and they too have found Kytephone's controls useful. "It finally allows them to give (their child) the phone," he says. "We do think Kytephone with its very simplified interface can be a great tool for parents with kids with disabilities."